Cardiovascular disease (CVD) is the leading cause of death in patients with stage 5 chronic kidney disease (CKD), and the mortality rate in stage 5 CKD is even higher in patients with diabetes. CVD risk reduction includes control of hyperglycemia, dyslipidemia, and BP. An LDL cholesterol goal of 70 mg/dl has been suggested for such high-risk patients. Most studies that have showed CVD risk reduction with statins have been in patients without CKD. However, some studies have had sufficient numbers of patients with CKD stages 2 to 3 to permit analysis, and these generally have shown CVD benefits similar to those found in patients without CKD. Studies that have shown benefit in patients who were on dialysis or after transplantation have been mixed, in part because CVD in such patients is far advanced and may not respond as well to intervention. As GFR falls, the dosages of many of the drugs that are used for the treatment of dyslipidemias need to be modified. In general, however, atorvastatin and fluvastatin dosages do not have to be modified. Drug interactions with cyclosporine also occur. In general, combinations of statins and fibrates should be avoided, and fenofibrate should be avoided in all patients with decreased GFR levels. Overall, on the basis of the very high risk for CVD in patients with diabetes and CKD, aggressive management of dyslipidemias is warranted, with an LDL goal of 70 mg/dl. Cardiovascular disease (CVD) is the leading cause of death in patients with stage 5 chronic kidney disease (CKD) (1,2). Mortality from CVD in this population is approximately 10 to 20 times higher than that in the general population (1). When the stage 5 CKD population is divided into those with and without diabetes, the annual mortality rate is increased by approximately 40% in those with diabetes (3,4). Conversely, when individuals with diabetes are divided into those with and without evidence of CKD, the CVD risk is far higher in those with evidence of diabetic kidney disease, even at the early stage of just microalbuminuria (30 to 300 mg/g creatinine) (5–9), and the risk increases as the kidney disease progresses to clinical albuminuria (>300 mg/g creatinine) and then decreased GFR (9,10). There are many risk factors for CVD in people with diabetes and CKD (11,12). Dyslipidemias have been found to be a major risk factor for CVD in individuals with and without diabetes (13). This review focuses on dyslipidemias as they occur in patients with CKD and diabetes as one of the major CVD risk factors that potentially is modifiable. The evidence that treatment of dyslipidemias will affect the development of CVD in patients with diabetes, those with CKD, and, importantly, those with diabetic CKD are examined so that treatment recommendations can be made. Type 1 diabetes usually is associated with normal LDL and HDL cholesterol levels and high triglyceride levels, the last being due primarily to poor glycemic control (14). Poor control with inadequate provision of insulin leads to a reduction in the activity of lipoprotein lipase and consequent inability to clear chylomicrons and VLDL (14). When control is very poor, HDL cholesterol levels also may be decreased and LDL cholesterol levels may be elevated (14). Type 2 diabetes generally is associated with reduced HDL cholesterol levels, elevated triglyceride levels, and normal LDL cholesterol levels, albeit there is a shift in the LDL particle size to the more atherogenic small, dense LDL particles (15). These changes are due to increased hepatic production of VLDL and impaired clearance of VLDL and chylomicrons, resulting in increased production of the small, dense LDL subspecies (15). The reduction of HDL cholesterol is due primarily to an increased transfer of cholesterol from HDL to triglyceride-rich lipoproteins with concomitant transfer of triglycerides to HDL. These triglyceride-rich particles then are hydrolyzed by hepatic lipase and rapidly catabolized and cleared (15). Insulin resistance increases hepatic lipase activity, which then hydrolyzes phospholipids in LDL and HDL particles, leading to smaller, denser LDL particles and a decrease in the HDL2 subspecies (15). Distinction has to be made between patients with and without nephrotic syndrome, because the presence of hypercholesterolemia is one of the criteria for making the diagnosis of nephrotic syndrome. Patients with nephrotic syndrome in CKD stages 1 through 4 have both an increased production and a decreased catabolism of LDL cholesterol, resulting in increased total and LDL cholesterol levels (16). Furthermore, there is an inverse correlation between serum albumin levels and total and LDL cholesterol levels (17). HDL cholesterol levels are normal to low in patients with nephrotic syndrome (17,18). Hypertriglyceridemia also may occur and is presumed to be related to a decreased catabolism of triglycerides (16). Patients with nonnephrotic CKD stages 2 through 4 tend to have normal LDL cholesterol levels, decreased HDL cholesterol levels, and elevated triglyceride levels (16). These alterations are thought to be due to reduced lipoprotein lipase activity (16). Data that analyze lipid levels of patients with versus without diabetes and with CKD are sparse. Hirano et al. (19) compared lipid levels in patients with type 2 diabetes, normal GFR levels, and varying degrees of albuminuria; they found essentially no differences in LDL and HDL cholesterol levels in those with normal urine albumin excretion, microalbuminuria, and clinical albuminuria but elevated triglyceride levels in those with clinical albuminuria. All three groups of patients with diabetes in that study tended to have LDL cholesterol levels that were higher than those of control subjects without diabetes along with lower HDL cholesterol levels and higher triglyceride levels (19). Joven et al. (20) found that in patients with and without type 2 diabetes and with nephrotic syndrome and normal GFR, total cholesterol, LDL cholesterol, HDL cholesterol, and triglyceride levels were similar. In another study, in nonnephrotic patients with poorly controlled (glycosylated hemoglobin 9.3%) type 1 diabetes and reduced GFR, triglycerides tended to be higher, but there was little difference in total, HDL, and LDL cholesterol levels compared with patients without diabetes and with similar degrees of renal impairment (21). In a recent analysis of patients in the Pravastatin Pooling Project, baseline lipids were compared in patients with and without diabetes and with and without CKD, defined as GFR <60 or 60 to 89.9 ml/min per 1.73 m2 with trace proteinuria or more on dipstick (10). In this analysis; for the four groups of no CKD/no diabetes, CKD/no diabetes, no CKD/diabetes, and CKD + diabetes, the LDL cholesterol levels were 166.1, 152.6, 143.6, and 140.2 mg/dl, respectively; the HDL cholesterol levels were 40.5, 38.4, 36.4, and 36.3 mg/dl, respectively; and the triglyceride levels were 158.0, 160.9, 175.7, and 181.1 mg/dl, respectively (10). In patients who are on hemodialysis, LDL cholesterol levels generally are normal, but triglyceride levels are high and HDL cholesterol levels are low (16). However, the Kidney Disease Outcomes Quality Initiative (K/DOQI) guideline on dyslipidemias in patients with CKD review found that 55.7% of patients who are on hemodialysis had LDL cholesterol levels >100 mg/dl (2). Patients who are on peritoneal dialysis tend to have higher LDL cholesterol levels (16) and the K/DOQI guideline review found that 73.2% of patients had LDL cholesterol levels >100 mg/dl (2). After kidney transplantation, LDL cholesterol levels usually are elevated, and this may be due to the effects of glucocorticoids, cyclosporine, and sirolimus (2,16). Several large, prospective, randomized studies have demonstrated marked cardiovascular benefits with the treatment of dyslipidemias in patients with and without diabetes, and are reviewed only briefly here. Most of the studies that have examined these treatment effects on people with diabetes used subset analyses of this group that were part of the original study design, and all but two used “statins” as the intervention: The Helsinki Heart Study (HHS) and the Veterans Administration High-Density Lipoprotein Cholesterol Intervention Trial (VA-HIT), which used gemfibrozil (22,23). Among six primary prevention trials in which diabetes subgroup analyses were performed (Air Force/Texas Coronary Atherosclerosis Prevention Study [AFCAPS/TexCAPS], Antihypertensive and Lipid-Lowering Treatment to Prevent Heart Attack Trial [ALLHAT-LLT], Heart Protection Study [HPS], Prospective Study of Pravastatin in the Elderly at Risk [PROSPER], Anglo-Scandinavian Cardiac Outcomes Trial—Lipid-Lowering Arm [ASCOT-LLA], and HHS), five of six showed benefit on CVD, but statistically significant benefit was found only in the very large HPS and ASCOT-LLA (22,24–29). In fact, in the PROSPER study of elderly patients, there was a trend toward harm with pravastatin use (28). A formal meta-analysis of these trial results showed a pooled relative risk for CVD events with lipid-lowering therapy in patients with diabetes of 0.78 (95% confidence interval [CI] 0.67 to 0.89) (30). The Collaborative Atorvastatin Diabetes Study (CARDS) was a more recent primary prevention, placebo-controlled study that was limited to people with type 2 diabetes. CARDS showed that in 2838 patients, those who were randomly assigned to atorvastatin 10 mg had a relative risk reduction of 37% for cardiovascular events and a 27% reduction in total mortality (31). In CARDS, the entry creatinine exclusion was 1.7 mg/dl (150 μmol/L), but no analysis was carried out according to renal status. Among eight secondary prevention trials in which there was a diabetes subgroup analysis (Scandinavian Simvastatin Survival Study [4S], Cholesterol and Recurrent Events [CARE], HPS, Long-Term Intervention with Pravastatin in Ischemic Disease [LIPID], Lescol Intervention Prevention Study [LIPS], Post-Coronary Artery Bypass Graft [Post-CABG], Veterans Administration High-Density Lipoprotein Cholesterol Intervention trial [VA-HIT], and PROSPER), all showed some benefit in reduction of CVD events, but only the results from the 4S, CARE, HPS, LIPS, and VA-HIT studies were statistically significant (22,26–28,32–36). Again, there was a trend toward a harmful effect in PROSPER (28). A formal meta-analysis of these trial results showed a pooled relative risk for CVD events with lipid-lowering therapy of 0.76 (05% CI 0.59 to 0.93) (30). Excluding the HHS and VA-HIT studies, which used gemfibrozil, did not change the estimates for relative risk reduction for meta-analyses for either the primary or the secondary prevention data (30). Secondary analyses of the HPS showed that similar risk reductions in CVD occurred when LDL cholesterol levels were lowered from <116 to <77 mg/dl and even from <97 to 65 mg/dl for the entire study (26), and in the diabetes subgroup, a similar risk reduction also was found when LDL cholesterol levels were lowered from <116 to <77 mg/dl (27). In CARDS, a reduction to <70 from <118 mg/dl showed benefit similar to those who started at higher levels. Reductions in events going down to LDL cholesterol levels of approximately 70 mg/dl also were shown in the recent Pravastatin or Atorvastatin Evaluation and Infection Therapy-Thrombolysis in Myocardial Infarction (PROVE-IT) (37) and the Treat to New Targets (TNT) (38) studies. As a result of these newer trials’ showing efficacy at lower starting and target LDL cholesterol levels, the Adult Treatment Panel III of the National Cholesterol Education Program in 2004 issued a modification of their 2002 guidelines, indicating that in very-high-risk patients, an LDL cholesterol goal of <70 mg/dl even in those who start with levels <100 mg/dl is a reasonable therapeutic option (39). On the basis of their very high risk for CVD, it seems that patients with diabetes and CKD should have as a goal an LDL cholesterol <70 mg/dl. Although it is tempting to extrapolate the previously mentioned studies to patients with CKD, it must be emphasized that most of these studies had known CKD as an exclusion criterion, so direct data showing benefit of “statin” therapy on CVD in patients with CKD are limited. The HPS had an upper exclusion for serum creatinine of 2.26 mg/dl (200 μmol/L) (26). They did perform a subgroup analysis of patients with elevated creatinine and normal creatinine, using levels of 1.24 mg/dl in women and 1.47 mg/dl in men as cutoff values (26). For individuals without diabetes, the relative risk reductions were 21.4% for those with normal creatinine levels (n = 13,554) and 29.6% for those with elevated creatinine levels (n = 1019), both being statistically significant (Figure 1). For individuals with diabetes, the relative risk reductions were 18.4% for those with normal creatinine levels (n = 5653) and 22.6% for those with elevated creatinine levels (n = 319), with the reduction in the normal creatinine group being statistically significant but that in the elevated creatinine group being only borderline significant. It should be noted that for the group without diabetes, overall, those with elevated creatinine levels had a 47% increased risk for CVD events compared with those with normal creatinine levels, and for the group with diabetes, this increased risk was 80.1% (26). Percentage of patients who did and did not have diabetes, had cardiac events, and had normal renal function (serum creatinine <1.24 mg/dl in women [F] and <1.47 mg/dl in men [M]) and decreased renal function (serum creatinine 1.24 to 2.26 mg/dl in women and 1.47 to 2.26 mg/dl in men) and were treated with placebo or simvastatin 40 mg in the Heart Protection Study (26,27). The risk reductions were significant for the patients without diabetes and with and without elevated creatinine levels and for the patients with diabetes and without elevated creatinine levels. The numbers of patients in each group are shown at the foot of each column. Similarly, a secondary analysis was performed in the CARE study (40). Among the 4159 patients in the total study, 1711 had a creatinine clearance calculated to be ≤75 ml/min using the Cockcroft-Gault equation (41). In this analysis, of the 1711 with a reduced creatinine clearance, the adjusted relative risk reduction was 0.28 (95% CI 0.05 to 0.45) for the primary end point of fatal coronary disease or myocardial infarction (MI). The risk reductions were similar for the 237 (26.5%) patients with diabetes and the 1474 (23.2%) patients without diabetes. The risk reductions were 28.6% in the 1042 patients with a clearance between 60 and 75 ml/min and 18.4% in the 669 with a clearance of ≤60 ml/min (40). For the primary end point, the risk reduction was similar (40) when the calculation of GFR used the abbreviated Modification of Diet in Renal Disease (MDRD) study equation (42). In the Pravastatin Pooling Project, Tonelli et al. (43) pooled data from three large studies in which pravastatin 40 mg had been used to determine benefit on CVD: The CARE study (see previous section), the LIPID study, and the West of Scotland Coronary Prevention Study (WOSCOPS). The creatinine clearance was calculated using the Cockcroft-Gault formula (41). Of the 19,700 total participants in these studies, 2876 had creatinine clearance levels >90 ml/min per 1.73 m2, 12,333 had levels of 60 to 89.9 ml/min per 1.73 m2, and 4491 had levels of 30 to 59.9 ml/min per 1.73 m2. In these three groups, the percentage of individuals with diabetes were 8.1, 6.2, and 9.9 respectively. The relative risk reductions for the primary outcome of the combined end point of CVD death, MI, or revascularization were 0.23 (95% CI 0.14 to 0.40), 0.24 (95% CI 0.17 to 0.30), and 0.22 (95% CI 0.06 to 0.35) for the three groups, respectively (43). Recently, Tonelli et al. (10) reported data specifically from the patients with diabetes in the Pravastatin Pooling Project, using slightly different definitions of CKD: GFR <60 ml/min per 1.73 m2 for all three studies and GFR 60 to 89.9 ml/min per 1.73 m2 plus dipstick-positive proteinuria in the CARE and LIPID studies. In this new analysis, they found that pravastatin significantly reduced the absolute risk for the primary outcome by 3.5% in the 14,194 with neither CKD nor diabetes, by 4.5% in the 4099 with CKD and no diabetes, by 5.0% in the 873 with diabetes and without CKD, and by 6.4% in the 571 with CKD and diabetes (10). However, when they used a definition of CKD of just a GFR <60 ml/min per 1.73 m2, the benefits of pravastatin were statistically NS, but the benefits were of similar magnitude. In dialysis patients, two observational studies showed that statin use was associated with a reduction in mortality. In the US Renal Data System Dialysis Morbidity and Mortality Wave 2 study, a randomly selected cohort of 3716 patients who started dialysis in 1996 and were followed through July 1998 were studied (44). Only 362 (9.7%) were using statins, but they had a relative risk reduction of 0.32 (95% CI 0.13 to 0.46) for total mortality and 0.36 (95% CI 0.09 to 0.55) for cardiovascular mortality compared with patients who were not using statins (44). In this study, 59% of the statin users and 49.1% of the nonusers had diabetes. In the Dialysis Outcomes and Practice Patterns Study (DOPPS I), a randomly selected cross-section of 7365 patients who were receiving dialysis in Europe, the United Kingdom, and Japan were followed longitudinally for 3 to 5 yr; statins were prescribed in only 11.8% of patients overall. In the DOPPS I study, statin use was associated with a 31% lower risk for all-cause mortality (P < 0.0001) and a 23% lower cardiac mortality (P = 0.03) compared with patients who were not using statins (45). 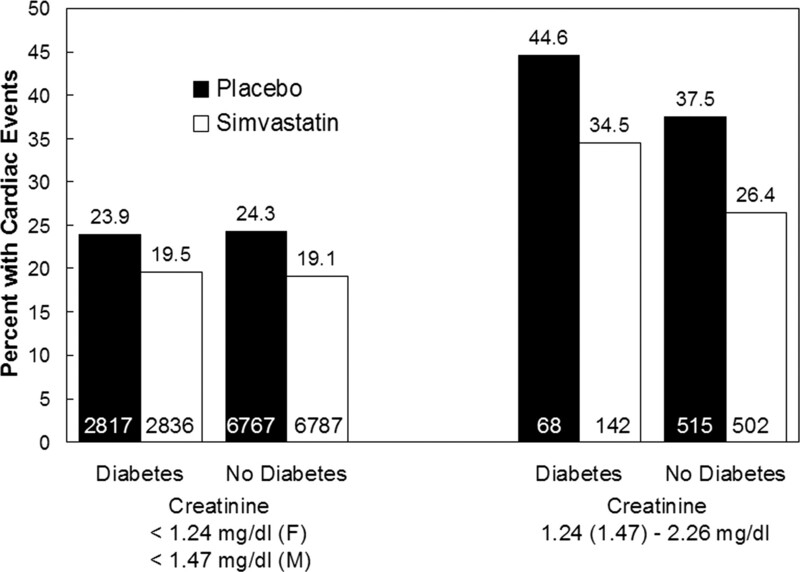 In this study, 43.4% of the statin users and 32.4% of the nonusers had diabetes (45). In 2005, Wanner et al. (46) reported the CVD outcomes of a large (n = 1255) study in patients who had type 2 diabetes and had started on dialysis within the previous 8 mo; the patients were randomly assigned to atorvastatin 10 mg or placebo and followed for a median of 4 yr. With atorvastatin, the median LDL cholesterol level decreased from 121 to 72 mg/dl, and it was unchanged with placebo treatment. For the primary composite end point of death from cardiac causes, nonfatal MI, and stroke, there was an 8% risk reduction that was NS. In this study, the risk for fatal stroke actually was increased significantly with a relative risk of 2.03 for atorvastatin use (95% CI 1.05 to 3.93; 13 events in the placebo group and 27 in the atorvastatin group), but there was no difference between the groups with respect to nonfatal stroke (32 in the placebo group and 33 in the nonfatal group). When all cardiac events are combined without stroke being included, there was a significant relative risk reduction of 0.18 (95% CI 0.01 to 0.32) with atorvastatin (246 in the placebo group and 205 in the atorvastatin group). When both fatal and nonfatal stroke are combined, the increase in the atorvastatin group no longer is significant (70 in the placebo group and 79 in the atorvastatin group) (47). Therefore, the interpretation of the results of this study is difficult, and much depends on how much weight to give to the predetermined primary outcome rather than some of the secondary analyses. Only one large, randomized, controlled trial has examined the use of statins in renal transplant patients: The Assessment of LEscol in Renal Transplantation (ALERT) study (48). In this study, 2102 renal transplant recipients were randomly assigned to fluvastatin 40 mg or placebo and followed for a mean of 5.1 yr. Although fluvastatin reduced LDL cholesterol levels by 32%, the 17% risk reduction for the primary end point of cardiac death, nonfatal MI, or coronary intervention procedure was NS (48). However, there were 35% (95% CI 0.12 to 0.52) fewer cardiac deaths or nonfatal MI in the fluvastatin group (48). Subsequent post hoc analyses of the data from this study suggested that significantly greater reductions in cardiac deaths and nonfatal MI occurred when therapy was initiated within 6 yr of the transplant compared with later times (47). Furthermore, a 2-yr extension of the ALERT study showed that there was a continued reduction in cardiac death or nonfatal MI (49). One reason that these studies in dialysis and transplant patients have shown only mixed results and not clear benefits may be that these patients have had such long-standing CKD and diabetes that their CVD becomes so advanced that it is less responsive to such interventions. A major confounding factor in some of these studies is that benefits were seen when just cardiac outcomes were measured but no benefits were seen with stroke outcomes; in fact, stroke actually seemed to be increased modestly when kidney disease was present (10,46,48). The reason for this opposite effect on stroke outcomes is not clear; baseline BP in treatment and placebo groups were equal in these studies, but BP during the study were not reported and an imbalance might affect the results. It should be noted, however, that benefits of statins in reducing strokes were seen in CARDS (31) and HPS (26,27), both very large studies, but with GFR levels considerably higher than the previously mentioned three studies. Although many studies have shown associations of CVD risk and low HDL cholesterol levels and elevated triglyceride levels, few prospective, randomized trials have addressed directly therapies that are directed at these abnormalities and CVD risk. In the VA-HIT study, gemfibrozil increased HDL cholesterol levels by 5% and lowered triglyceride levels by 20% with no change in LDL cholesterol levels, and there was a 32% risk reduction (95% CI 0.12 to 0.47) in cardiac events (23). However, in the much smaller Helsinki Heart Study, which had only 135 patients with type 2 diabetes, triglycerides were lowered by 26%, HDL cholesterol levels were raised by approximately 6%, and LDL cholesterol levels were lowered by 10%, but the number of cardiac events in this subgroup was too small to permit significance to be determined (22). The Fenofibrate Intervention and Event Lowering in Diabetes (FIELD) study also was limited to patients with type 2 diabetes, 2131 with previous CVD and 7664 without, and randomly assigned patients to fenofibrate 200 mg/d or placebo (50). Compared with placebo, fenofibrate therapy resulted in initial reductions in LDL cholesterol of 12% and in triglycerides of 29% and an increase of HDL cholesterol of 5%, but the last decreased to 2% by the end of the study. Although the 11% reduction in the primary end point of coronary heart disease death or first nonfatal MI was NS, there was a significant 24% reduction in nonfatal MI and a significant 11% reduction in the secondary outcome of total CVD events (CVD death, MI, stroke, and coronary and carotid revascularization). There was a far greater effect in the primary prevention arm of this study than the secondary intervention arm (50). In FIELD, the entry creatinine exclusion was 1.47 mg/dl (130 μmol/L); no analysis was carried out according to renal status (50). The concept that lipids might contribute to the progression of CKD was proposed in 1982 by Moorhead et al. (51). Many mechanisms have been postulated for this potential effect and have been reviewed elsewhere (52,53). A meta-analysis of a number of small studies that were carried out using lipid-lowering therapy to reduce the progression of CKD showed that there were small beneficial effects on the fall of GFR of 0.156 ml/min per mo (95% CI 0.026 to 0.285) and on proteinuria (54). Two subsequent relatively small studies of 63 and 56 patients with proteinuria found approximately 50% reductions in urinary protein excretion with pravastatin 10 mg (55) and atorvastatin in varying dosages (56). Secondary analyses of data from some of the CVD outcome studies examined the effect of lipid-lowering therapy on kidney function. From the VA-HIT study, gemfibrozil treatment of 399 patients who were in CKD stage 3 (GFR 30 to 59.9 using the MDRD formula) had no effect on the change in GFR compared with placebo (57). In contrast, in the FIELD study, fenofibrate resulted in significantly more patients’ regressing or not progressing in their urinary albumin excretion (50). In the CARE study, in which 690 patients had calculated GFR (MDRD) levels <60 ml/min per 1.73 m2, pravastatin had no significant effect on GFR compared with placebo, although there is a suggestion that there may have been an effect in those with GFR levels <40 ml/min per 1.73 m2 (58). In the Pravastatin Pooling Project, in those with estimated GFR levels of 30 to 59.9 ml/min per 1.73 m2, there was a significant 34% reduction in the rate of fall of GFR with pravastatin, but the magnitude of this reduction was minimal at 0.22 ml/min per 1.73 m2/yr (59). In the HPS, simvastatin use was associated with a significant (P = 0.0003) albeit very small difference of −0.8 ml/min over the mean of 5 yr in the rate of fall of estimated GFR (26). However, in the Greek Atorvastatin and Coronary Heart Disease Evaluation (GREACE) study, patients who were treated with atorvastatin experienced a 12% increase in creatinine clearance (Cockcroft-Gault), those who were treated with various statins in usual care experienced a 4.9% increase in creatinine clearance, whereas those on no statin therapy experienced a 5.2% decrease in creatinine clearance (P > 0.0001) (60). Conversely, in the ALERT study, fluvastatin did not have a significant affect on the decline of GFR or kidney graft loss (61). There may be a small effect of fenofibrate and statins on urinary protein excretion and an even smaller effect on GFR. These effects clearly are minor compared with the major effects on CVD. Some dosage modifications for some of the statins need to be carried out as GFR levels fall (Table 1). Atorvastatin and it metabolites are excreted mostly in bile, and urinary excretion is low, so dosages do not have to be modified as GFR levels fall (62). Atorvastatin can be given in dosages up to 80 mg/d in patients who are on both hemodialysis and chronic ambulatory peritoneal dialysis (CAPD) (62). In patients who are on hemodialysis, the dosage can be given before or after dialysis (62). Fluvastatin is almost completely metabolized by the liver with <5% excreted in the urine (62). Therefore, it also can be given in dosages up to 80 mg/d even in patients who are on hemodialysis and CAPD (62). Data on pravastatin are less certain with respect to declining GFR levels, and pravastatin and its active metabolites may accumulate (62). Therefore, it has been recommended that dosages of pravastatin start at 10 mg/d and higher doses be used cautiously when the GFR is <50 ml/min per 1.73 m2 (62). However, as noted in the Pravastatin Pooling Project, 40 mg was used down to 30 ml/min per 1.73 m2, and there were no adverse effects from this (43,59). Simvastatin is almost completely metabolized by the liver (62). In the First United Kingdom Heart and Renal Protection (UK-HARP-I) study, 448 patients with CKD (242 predialysis patients with serum creatinine level ≥1.7 mg/dl, 73 on hemodialysis and 133 with a transplant) were randomly assigned to simvastatin 20 mg or placebo for 1 yr. LDL cholesterol levels were lowered by 27, 20, and 20 mg/dl in these three groups without any significant increase in the adverse effects of muscle pain, muscle weakness, rhabdomyolysis, or elevation of creatinine phosphokinase (CPK) or ALT (63). In the HPS, patients were treated with 40 mg/d in many patients with stage 3 CKD without an excess risk for rhabdomyolysis (26,27). Rosuvastatin is 90% excreted unchanged in the feces and only 10% in urine (59). When the GFR is <30 ml/min per 1.73 m2, it has been found to accumulate, so it should not be given at a dosage of >10 mg with this degree of CKD (64). Ezetimibe is being used with increasing frequency in many patients to augment the LDL cholesterol–lowering effects of statins (65). The recent Second United Kingdom Heart and Renal Protection (UK-HARP-II) study found in a randomized, controlled study that 10 mg of ezetimibe added to 20 mg of simvastatin in 203 patients with CKD (152 predialysis patients with serum creatinine ≥1.7 mg/dl, 18 on peritoneal dialysis and 33 on hemodialysis) resulted in an incremental 21% reduction of LDL cholesterol levels over simvastatin alone without an excess risk for abnormal liver or muscle function tests or other adverse events (66). Therefore, no dosage adjustment of ezetimibe is needed in patients with renal insufficiency (65,66). Bile acid sequestrants, such as cholestyramine, also can be used, and the dosage does not have to be altered with decreases in GFR (2). On the basis of this discussion, when the GFR falls to <30 ml/min per 1.73 m2, it seems that atorvastatin and fluvastatin are preferred because no dosage adjustments need to be made. When greater lowering of LDL is needed, ezetimibe can be added and dosages do not have to be adjusted even for severe CKD (65,66). Bile acid sequestrants also may be helpful in some patients, although they may raise triglyceride levels (2). One also should not forget that the phosphate-binding polymer sevelamer also has substantial LDL-lowering properties; one study showed a decrease of 33 mg/dl (67), and this property may be useful in some patients. Elevated triglycerides that persist after optimization of glycemic control and dietary fat and alcohol restriction may be treated with fibric acid derivatives, but the actual threshold for treatment is not clear. As levels get to be >1000 mg/dl, the risk for pancreatitis increases substantially. Farbakhsh and Kasiske (16) recommended treatment for levels of >500 mg/dl. Gemfibrozil dosing does not have to be adjusted even for CKD stage 4 (16); in CAPD patients, dosages of >600 mg/d have been associated with an increased frequency of CPK elevations (68). However, fenofibrate dosages should be reduced by one third in CKD stage 2, by an additional one third in CKD stages 3 and 4, and avoided in CKD stage 5 (2). Combinations of fibrates and statins probably best are avoided in patients with CKD to avoid the complication of rhabdomyolysis (2,16,69). Low levels of HDL that persist after optimization of glycemic control may be treated with nicotinic acid given in a sustained-release formulation. Dosages do not have to be adjusted until CKD stage 5, when the dose should be reduced by 50% (2). It should be understood, however, that outcome studies showing CVD benefit from nicotinic acid are lacking at the present time (70). Glucocorticosteroids cause an increase in insulin resistance and an increase in hepatic glucose output, causing hyperglycemia to worsen and an increase in triglycerides and variable changes in HDL cholesterol levels (71). Both cyclosporine and tacrolimus can induce insulin resistance and impair insulin secretion, but tacrolimus seems to be much worse in this regard (72,73). Because it affects the CYP3A4 pathways, cyclosporine can have major drug interactions with some of the statins. Although atorvastatin has relatively minimal effects on cyclosporine levels, cyclosporine levels should be monitored when starting atorvastatin. Conversely, cyclosporine can cause a significant elevation of atorvastatin levels and seems to increase the risk for myopathy and rhabdomyolysis (62,69). In contrast, fluvastatin is metabolized by multiple pathways, and cyclosporine does not modify its levels (62). In the large ALERT study, in which fluvastatin was given to transplant patients in a dosage of 40 mg/d and then increased to 80 mg/d, the increases in transaminases and CPK were similar in the fluvastatin and placebo groups (48). Although pravastatin is not metabolized by the CYP3A4 pathway, cyclosporine can cause a marked increase in serum pravastatin levels. Pravastatin also can increase cyclosporine levels, so those need to be monitored upon starting this drug (62). Simvastatin levels can be increased by cyclosporine, and cases of rhabdomyolysis have been reported with this combination; it has been recommended that dosages be limited to 10 mg (62). However, no problems were seen with 20 mg in the UK-HARP-I and UK-HARP-II studies (63,66). Conversely, simvastatin can raise cyclosporine levels. Cyclosporine also can increase rosuvastatin levels, and it has been recommended that dosages not exceed 5 mg/d in patients who are taking cyclosporine. However, rosuvastatin does not seem to alter cyclosporine levels. Patients with type 1 and 2 diabetes and progressing kidney disease are at very high risk for CVD, as shown by many studies. The lowering of LDL levels using statins has been proved clearly to be beneficial for patients with and without diabetes and with normal kidney function with respect to the risk for CVD. Most data showing similar benefits in patients with diabetes and CKD come from post hoc analyses of subgroups in some of these large studies. On the basis of these data, statins also seem to be efficacious in lowering CVD risk, at least through CKD stages 1 through 3. Because this group is at such high risk, an LDL cholesterol target of 70 mg/dl seems appropriate, although there are no direct data to support this in patients with CKD. An ongoing large study called the Study of Heart and Renal Protection (SHARP) has the goal of randomly assigning 9000 patients with more moderate degrees of CKD (serum creatinine levels of ≥1.7 mg/dl in men and ≥1.5 mg/dl in women) to simvastatin 20 mg plus ezetimibe 10 mg versus placebo (74), and the results of this study well may influence these recommendations. It also is important to perform dosage adjustments as the GFR falls, except for atorvastatin and fluvastatin. The data regarding the use of statins in patients who are on dialysis and after transplantation are less solid. Although two observational studies in dialysis patients suggested a beneficial effect (44,45), the randomized atorvastatin 4D study in patients with diabetes gave mixed results (46). Mixed results also were seen for fluvastatin in transplant patients (47–49). My own personal interpretation of these studies is that, overall, the results were positive and should not deter the use of statins in this population. Because of the concerning effect on stroke in this setting, it seems prudent to avoid statins in patients who are at particularly high risk for ischemic stroke, however. Although the discussion here has been based primarily on the concept that the primary beneficial effect of statins is on the reduction of LDL cholesterol levels, there is a growing literature to suggest that statins also may have beneficial cholesterol-independent effects on endothelial function, inflammation, and perhaps other aspects of vascular function (75). Whether these pleiotropic effects play any special role in the patient with diabetic CKD remains to be seen. There are virtually no data showing benefit of raising HDL cholesterol levels and lowering triglyceride levels in patients with CKD. Certainly, the primary goal should be lowering LDL cholesterol levels with statins, and any additional medications that are added to change these other lipid parameters should be secondary and done cautiously. This information was presented in part at the Annual Meeting of the American Society of Nephrology; November 8 to 13, 2005; Philadelphia, PA.